What does exit pupil mean? If you hold your binocular away from your eyes, toward the sky, you see a little bright circle in the middle each eyepiece. That's the column of light coming through the binocular to your eye. The diameter of that circle of light is called the exit pupil of the binocular. You can calculate the exit pupil by dividing the magnification of the binocular into the diameter of the objective lenses. So a 10x32 binocular (like the top Swarovski EL in the photo ) has an exit pupil of 3.2 millimeters. The larger a binocular's objective lenses, the larger the exit pupil; but the greater the magnification, the smaller the exit pupil. You often hear that a larger exit pupil makes a binocular brighter. It's true, but only within limits. We can see only the light that enters through our pupils. How big an exit pupil do you need? In daylight, when the pupils are perhaps as small as 2 millimeters, part of the column of light coming through the binocular will fall on the iris (pigmented part) of the eye instead of the pupil. That part of the light does not contribute to the brightness of the image. In the photo below, only the center portion of the light is actually entering the pupil of the eye. This is the reason that a binocular such as an 8x32, with an exit pupil of 4mm, usually gives just as bright an image as an 8x42 binocular of equal quality. The older a person is, the less the pupil dilates in dark conditions. That's why compact binoculars, such as an 8x32, seem to be just made for an older person. For pupils that remain relatively small even in dim conditions, the smaller objective lens and smaller exit pupil provide just as bright an image as a larger, heavier, more expensive binocular. Cleaning your Binocular: the wrong way and the right way, and why it matters. A Question of Alignment: why it's important for your binocular's two barrels to be perfectly parallel. Chromatic Aberration: how it blurs the image, and how manufacturers correct for it. 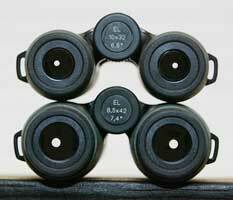 Diopter Adjustment: if you don't have it adjusted correctly, it can make your binocular almost useless. 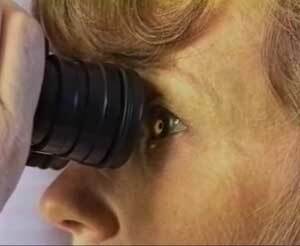 Eye relief: what it is, and why it is important for anyone who wears glasses while using binoculars. Field of View: why it matters, and how it relates to magnification. Copyright 2012-2013 Michael and Diane Porter.